Home Apparel Lanyard Star Wars Kylo Ren Lanyard by Funko Pop! Star Wars Kylo Ren Lanyard by Funko Pop! Funko - Star Wars Kylo Ren Lanyard by Funko Pop! The Pop! Vinyl version of your favorite character is the focus of this nifty Pop! lanyard! The Star Wars Kylo Ren Pop! 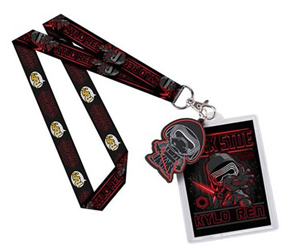 Lanyard includes a soft rubber charm and a badge holder, complete with a carded image of the First Order leader. Features the Star Wars: The Force Awakens and Pop! logos on one side, and an image of the Pop! style chararter and name on the reverse! Notify me of updates to Star Wars Kylo Ren Lanyard by Funko Pop!